Code4PA is a chance to collaborate and meet new people, learn new technology, build prototypes and apps and have fun. Everyone is welcome – programmers, developers, designers, project managers and others alike. This year’s theme is to help Pennsylvania turn data into insights for the opioid Epidemic. Participants will use a variety of datasets at least one from the PA Open Data Portal and any other open dataset related to opioids may be integrated to develop a solution that will help Pennsylvania address the Opioid Epidemic. Bring all your ideas, be creative, think big, think innovatively, and develop your life-changing idea. I have never been to a codeathon before, what should I do? We love first time coders! We will be providing mentors during the codeathon and running workshops. Come ready to learn, put your skills to work and network along the way. Is this event for me? I do not have coding experience. Yes, we need all skills and talents. Teams consisting of different talents create a richer more meaningful solution. In our workplace we create teams of all talents to work a project. Subject matter experts, analytical skills, coding skills, presentation abilities, the big idea or visionaries, project management, organizers, it takes us all. Bring your skills, join a team, collaborate and network, and you will learn something new while expanding your network and creating lasting friendships. When and where is Code4PA happening? Code4PA will take place on September 21st – September 22nd, at HU Harrisburg: 326 Market Street, Harrisburg, PA 17101, HU Philly: 1500 Spring Garden St, Philadelphia, PA 19130, Carnegie Mellon University Hamburg Hall: 4800 Forbes Ave., Pittsburgh, PA 15213 and The University of Pittsburgh Graduate School of Public Health: 130 De Soto Street, Pittsburgh, PA 15261. What is the pitch date on October 20th? Can I sign up for just the pitch date on October 20th? No. You must attend the Codeathon September 21st – September 22nd, in order to pitch your idea on October 20th. Why the time gap between the September weekend and October? Codeathons have determined that use cases and datasets are becoming larger and wanted to allow teams time to collaboratively work on further expanding upon ideas, designs, and apps. Why is there a location in Philadelphia and Pittsburgh and do I register at the same site if I want to participate in Philly or Pittsburgh? 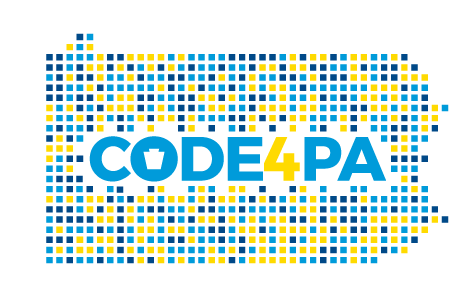 Code4PA 2018 is working with the well-established civic coding organization Code for Philly, and the University of Pittsburg, Carnegie Mellon University and the Western Regional Data Center in Pittsburgh. As part of expanding the capability of crowd souring resource expertise in Philly, Pittsburgh, and utilization of HU technology, this was an excellent opportunity for the first Code4PA 2018 codeathon. Registration is at the same link, just be sure to register for your preferred location. Everyone is welcome – programmers, developers, designers, project managers and others alike. If a professional firm is sponsoring a team that will represent the firm, we respectfully ask to only sponsor one team from the firm. Anyone organizing their personal team and not representing the firm is welcome to participate. Any one participating in Code4PA must be 18+ years old. As a team member. Teams of developers, designers, entrepreneurs and others come together to compete for cool swag and prizes. As a mentor. The competing teams need guidance to make their app and business concepts awesome. If you’ve launched a tech startup, worked in app development, have startup legal experience, know how to position a new app or business in the marketplace, love data, or are an open data activist, please join us. As a volunteer. We can use talents and skills in all kinds of ways. If you are interested in being part of the fun, let us know. Code4PA is free; however, parking is not included. For information on parking check out our parking information here. I have formed a team to compete in this competition. I have found data that is publicly available on the internet, can I use that data to generate idea? Yes publicly available data from the internet can be used to generate ideas. The solution you create must use at least one dataset from the Commonwealth of PA’s Open Data Portal – in addition you can add other datasets to create your solution. Teams must consist of at least two members with a maximum of eight members. We would highly recommend having a mix of technology experts and Health/Opioid Use Disorder (Business) experts to be members of the team. You’ll need an ID and the items you’ll need throughout the weekend. Laptop, chargers, phone, the basics. Are we required to use Open Source software? It is not a requirement to use Open Source software; however, with the culture of a codeathon, we encourage it. When registration is full. We anticipate registration to be full at around 240 individuals or approximately 30 teams throughout the three locations. Apply early.